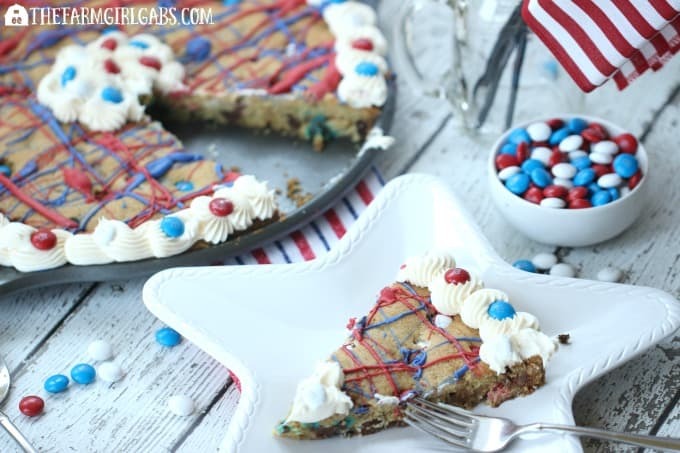 This festive Firecracker Cookie Cake is the perfect dessert for your patriotic celebration! Three cheers for the red, white and blue. 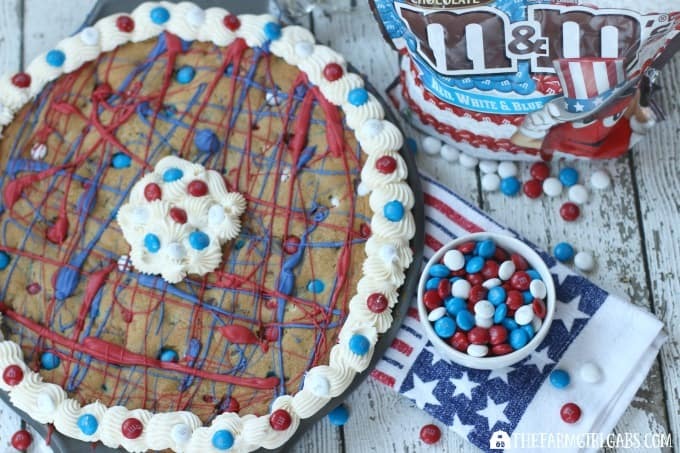 This Firecracker Cookie Cake, made with M&M’s® Red, White, & Blue Milk Chocolate, is a perfect way to celebrate our patriotism and honor the members of our military. Military service is something important in my family history. While I have no active duty military members currently, I am proud to say that my father served in the Korean war and four of my uncles (my mom’s brothers) were part of the Greatest Generation having served in World War II. One of my uncles was even awarded the Silver Star for his bravery during World War II. It’s because of these brave men and women who have served in the military in some capacity, that we have the many freedoms we take for granted today. As a child growing up, my uncles never really talked about their experience in World War II. They were humble and proud to have served, never expecting a “thank you” for what they endured. As a child, I never really understood or appreciated what their service to this great country meant. The true heroes were those that never made it home. My uncles had witnessed the harsh reality of war and lived to tell, while many of these men and women never did. 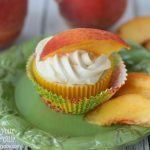 Are you planning to host a summer party soon? A great summer get-together always calls for a fun dessert . 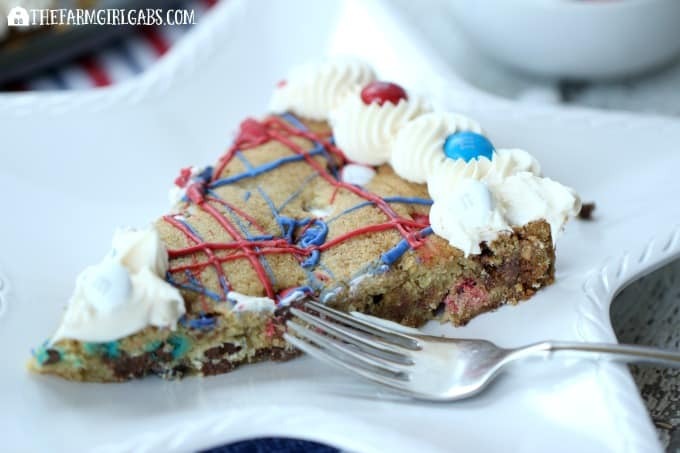 Show your patriotism with this easy Firecracker Cookie Cake. This recipe is a traditional chocolate chip cookie recipe on overload. It is jam-packed with M&M’s® Red, White, & Blue Milk Chocolate and pieces of SNICKERS®. 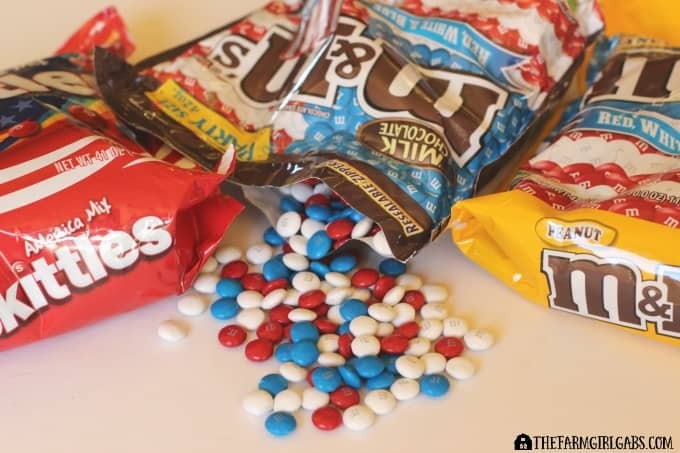 I just love the colorful patriotic colors of the M&M’s®! 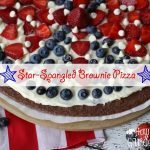 I baked this cake in a 12″ pizza pan . You can also use a 10″ cake pan too. It will make a thicker cake, but it will taste just as delicious. To make this cookie even more patriotic, I melted some red and blue melting wafers to drizzle on top once the cookie is cooled. 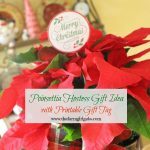 To save time in decorating the cake, I used a can of store-bought vanilla icing to add the finishing touches. Add some extra M&M’s® to the icing too. I made this cake for a party we attended over Memorial Day weekend. It’s a great way to show your American pride. If you have kids at home, this is a great way to get them in the kitchen. When my kids were younger, I loved to bake with them. Let them measure, mix, pour and decorate. It’s fun to lick the bowl too. However you choose to celebrate summer, there are two things you need to do! 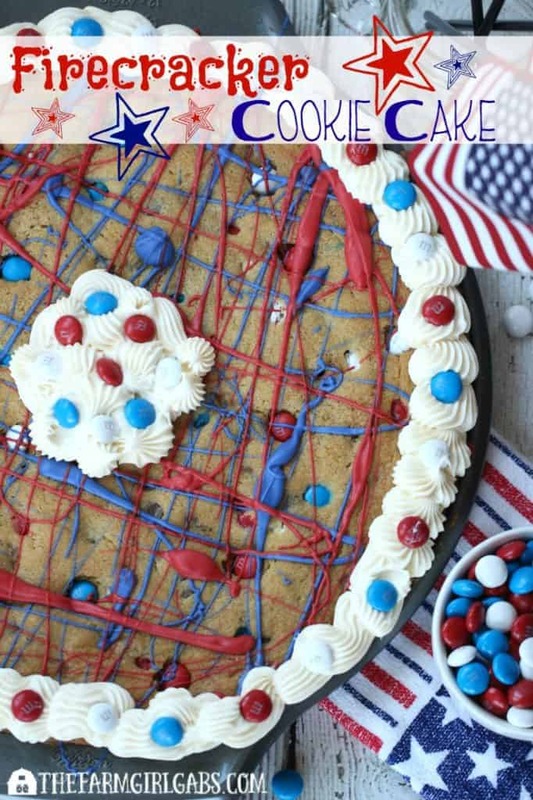 Don’t forget to thank a soldier, and make this Firecracker Cookie Cake for your next patriotic celebration. Your guests will be anxious to sink their teeth into this chocolate chip deliciousness. Grease a 12" round pizza pan and set aside. Add the butter to a bowl of a mixer. Beat on medium until light and fluffy. Add sugars and continue beating. When butter and sugar mixture are light yellow, add eggs, one at a time, Beat well between each. Add vanilla extract. Slowly at the flour mixture. Beat just until incorporated. Remove bowl from mixer. 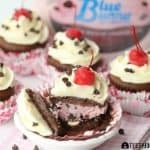 Add M&M's® Red, White, & Blue Milk Chocolate, chocolate chips and chopped chocolate candy. Mix by hand. Spread in the greased pizza pan. Add vanilla to a pastry bag with a large decorating tip. Pipe outer edge and a circle in the center.